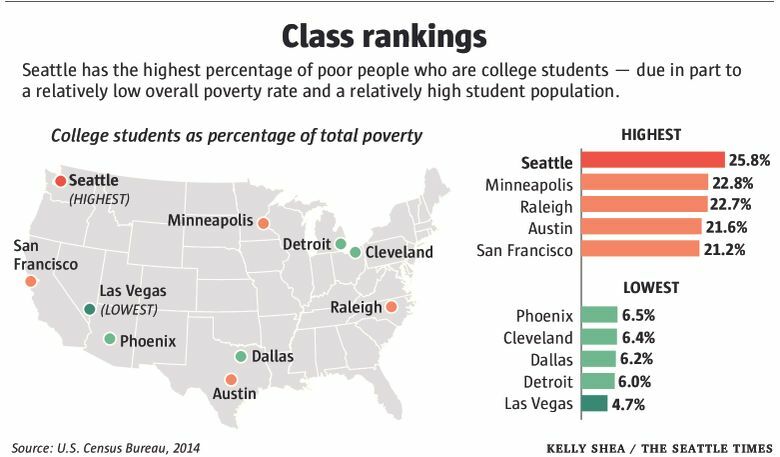 Seattle student poverty rate high, but are they truly poor? Among the 50 largest U.S. cities, Seattle has the highest concentration of college students among its population below the poverty line. The data also show a marked difference between North and South Seattle. What would you consider to be Seattle’s poorest neighborhood? A lot of folks might guess an area along the city’s southern border — Rainier Beach or South Beacon Hill, perhaps. But surprisingly, the neighborhood with the highest poverty rate — and it’s by a wide margin — is the University District. The reason, you’ve probably guessed, is college students. The University of Washington graduate student has at times relied on food banks. “I don’t eat out,” she laughs. Never mind all the new apartment construction and skyrocketing rents in the University District. Census data show that in the areas closest to the University of Washington campus, more than 60 percent of residents fall below the poverty line. The problem may not seem apparent because students experiencing hardship don’t always feel comfortable sharing details about their personal situation with classmates. Poverty status is determined by the Census Bureau through a set of income thresholds set by the federal government — for a single person in the continental U.S., it’s currently $11,770. Seattle’s poverty rate is 14.5 percent — among the lowest of any major city — which pencils out to 90,000 city residents. Remarkably, 23,000 of them are college and graduate students, more than a quarter of the total. Among the 50 largest U.S. cities, Seattle has the highest concentration of college students among its population below the poverty line. It’s a combination of our relatively low number of people in poverty and a large population of college students. But is it fair to lump student poverty together with what we commonly think of as poverty? It should be noted that the Census Bureau does not include all college students in its poverty calculations. Those residing in dormitories are excluded. But poverty status is determined for students living anywhere off-campus — such as fraternity houses, apartments or with family. There are about 64,000 students, or 10 percent of the city’s total population, living off campus. Of course, college students typically make very little money, so a high percentage fall below the poverty line. But poverty statistics don’t capture the whole picture. For example, students often get financial help from family. Many are living off student loans or receiving other forms of financial aid — money that doesn’t count as income in census calculations. And the dire financial situation of college students is, one hopes, temporary; once they graduate, their earning potential should increase significantly. But that isn’t to discount the difficulties that many students are facing, particularly those who come from low-income backgrounds. According to the National Center for Education Statistics, slightly more than half of undergraduate students are over 24 and financially independent of their parents. More than a quarter of undergraduates have at least one dependent child. At the UW, the 2014 senior-class gift set up a scholarship specifically to address the problem of students who are struggling to afford food. The scholarship has been granted to two students so far. “It’s an endowment, so we’re hoping it will keep growing every year, and as we’re able to reinvest the interest we’ll see more students benefit from it,” Hamilton said. University District Food Bank coordinator David Reuter said he doesn’t collect data on customers, but anecdotally many are college students. In fact, the UW has become aware of the problem and reached out. Berkeridge lives almost exclusively on student loans. 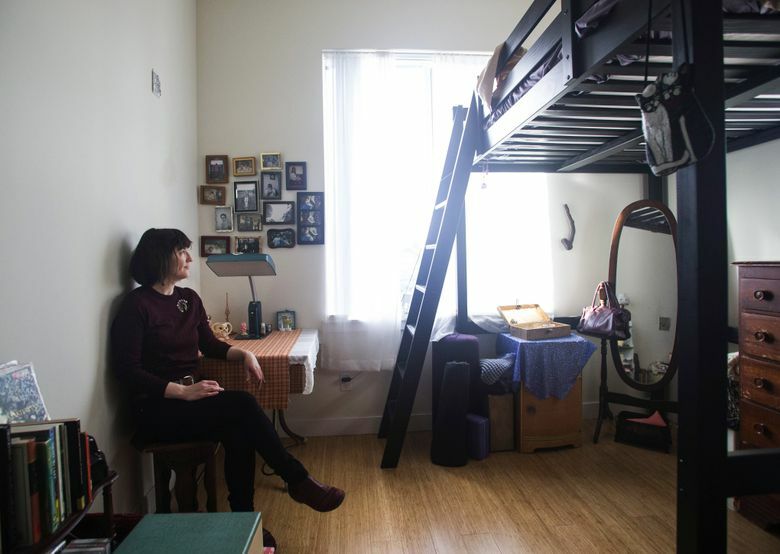 After tuition is covered, she has about $1,600 a month for living expenses — and $840 of that goes toward rent on her U-District micro-apartment. I asked Berkeridge if she would consider herself poor. She’s right. It’s the difference between being broke and being poor. I mapped out the census poverty data for Seattle twice — one with off-campus college students included, and then with them excluded. With students out of the equation, the divide between North and South Seattle comes into sharp relief. The poverty rate drops significantly in many central and north neighborhoods because students make up a big chunk of the population below the poverty line. But in South Seattle, the rate of poverty barely changes.